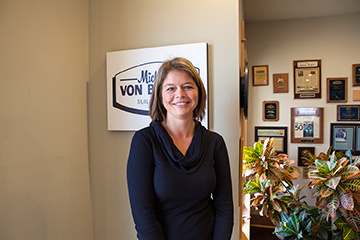 "Having Lynn join our project team further enhances the skills of our in-house team," said MVB Builder CO- owner Mike von Behren. "We're so happy to have her creativity and client focus here. Her focus on understanding and helping out our clients with what they need is perfectly aligned with what we've always believed in." Lynn earned a Bachelor degree in Interior Design from The University of Illinois at Champaign-Urbana. She has been involved in the Kitchen and Bath design and Home Construction Business for 23 years. Lynn is the mother of 4 children. She enjoys spending her free time watching them in their many athletic events.